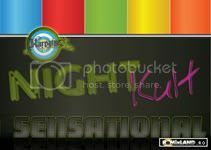 Romixland continue running another remix contest, this time the track to be remixed is “Sensational” from Night Kult. Another chance to got your tracks in the main digital stores and get a contract! The best remixes will be featured on a release alongside the original track and remixes already commissioned . The winning remixes will be mastered and also receive the remix contract and future opportunities to work with Karpatik Records. Remixers will receive 50% of the royalties earned from the remix. You must register to be able to download. .Sign Up your free Romixland Artist Account to Download the parts .